How Can Team Building Contribute to High-Performing Teams? With the ever-increasing demands of customers, workplace diversity, and complexity of the markets in which businesses operate, it is essential that businesses get the most out of their human capital. While many ideas regarding best practices of the last two decades have disappeared, one concept has remained: teamwork. Why? Because evidence suggests that teams typically outperform individuals, especially when the tasks at hand require multiple skills, good judgment, and experience. Research conducted by MIT’s Human Dynamics Laboratory found that the key to team success was not the substance of group discussions nor the intelligence, skill, and personality of each individual within the group. Instead, it was the manner in which the members communicated. Specifically the researchers found that “patterns of communication [are]. . . the most important predictor of a team’s success.” The report highlighted three key elements that underlie team performance: energy, engagement, and exploration. Energy refers to the magnitude of formal and informal communication between team members and how individuals contribute to a team as a whole. Engagement describes the degree of interaction between team members — how they communicate with each other and how they contribute to group discussions. Lastly, exploration refers to the extent to which team members engage with other teams working on related initiatives and report their findings to their own group — in other words, how teams communicate and interact with each other. How can we apply this knowledge to build and maintain great teams? Let’s look at what interactive and engaging team building events do to maximize each of these elements. Team building increases trust between employees and management. Often in corporate settings, there is a disconnect between the leadership team and employees because the employees sense too large of a gap between the two. Team building exercises give those in leadership the opportunity to be seen as colleagues rather than bosses, which can do wonders for employee morale and thus boost energy within the team. In our experience this result is evident. It fortifies the comfort of not being an only employee among others, but also employee to leadership team and vice versa. It is now common knowledge that extremely satisfied employees equal highly productive businesses. Where there’s a high level of job satisfaction, performance is really high. Research suggests that positive group dynamics lead to increases in employee satisfaction levels, sometimes by more than 10%. Team building is a great way for businesses to understand how group members interact, both with each other individually and with other teams. 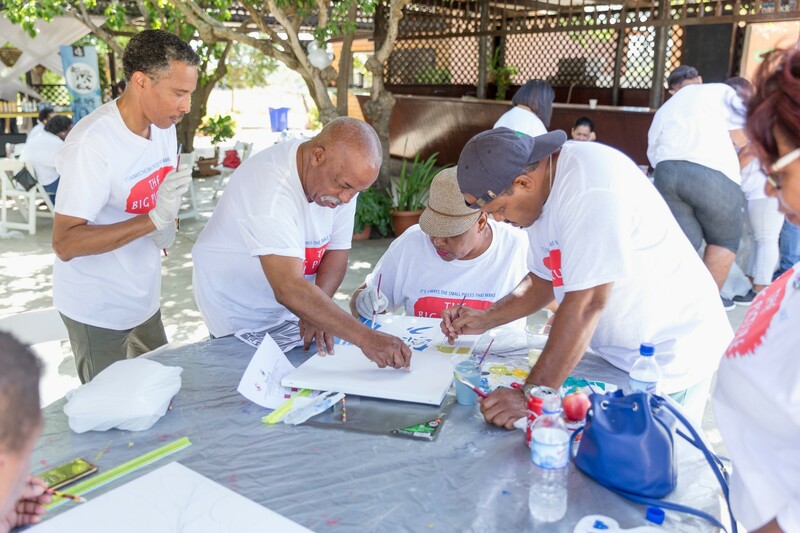 Recently, we conducted a GoTeam event for the Petrol Workers Federation of Curaçao. GoTeam is a one-of-a-kind GPS-enabled treasure hunt. We sent the teams out to explore the beautiful inner city of Willemstad with one goal: get as many points as you can. Throughout the day, the participants were given challenges via their smartphones. Challenges included a selfie contest, trivia questions, and experiential exercises, among others. This event required a lot of interaction: team members had to carry out challenges in a timely fashion, figure out where to go, and try to win the GoTeam challenge. Our customer is now reporting higher levels of interaction (especially informal) among its people. In addition to all these benefits, team building also promotes creativity among employees and helps them develop better problem solving skills. On a side note, for teams to perform well, they need to realize that they contribute to the bigger picture. Too often management measures contributions of people to one particular team. As a consequence, employees can be afraid to step out of their own group. Team leaders must motivate employees by clarifying their role in the company. You can read more about this here. High performance is no longer an art, but a science. There’s a logic to the relationship between organization, team, and individual performance. Individuals need to use effective team strategies to communicate and work in order to achieve organizational goals. You can take concrete, targeted action to enhance team performance, and by doing so increase efficiency and effectiveness in your organization. Team building can be an interesting strategy! Many companies fail to understand that team building is a long-term process. It is not something that should be done once a year. This will only boost the morale of the workforce on a short-term basis. Furthermore, a one-time activity shouldn’t be the only action taken to invoke change within a company and achieve its organizational goals. Ensuring the right work environment is also part of the process. D&I boasts a large portfolio of interactive and engaging team building programs focused on a wide variety of business benefits. Interested? Let’s see how we can be of service. Comments? Leave them below! Questions? I’m here to answer them!